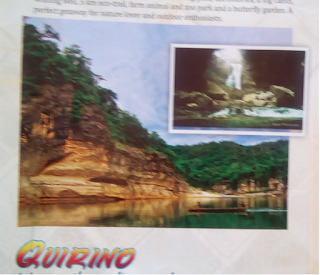 Quirino is a little known province located in Cagayan Valley Region within the upper Cagayan River Basin. It its north is I7sabela, southeast is Aurora and southweast is Nueva Vizcaya. The Sierra Madre Mountain Range serves a natural barrier on the eastern and southern border while the Mamparang Range on the western side. The Province of Quirino has a total land area of 3, 057 square km which is 8.4% of total regional area. It acquired its juridical personality after separating from the province of Nueva Vizcaya and Isabela on June 18, 1966 under RA 4734. Obviously it was named after Pres. Elpidio A Quirino. It was formally established on Feb 10, 1971 headed by its first Provincial Governor, Dionisio A Sarandi. Qurino Province is composed of municipalities named – Maddela, Saguday, Cabarroguis Diffun and Aglipay. This province used to be a forest region of Nueva Vizcaya where tribal groups Negrito or Pugots live. Ilocano dialect is used in the lowlands while Ifugaonon in the upward parts. Aglipay Caves And Campsites – Located at Villa Ventura, it is home to 38 caves where only 7 of these have been turned converted to tourist spots. These caves is in the midst of rolling hills and verdant forest that boast of peculiar characteristics like underground spring and well – preserved stalagmites and stalactites. These are interlink to each other to a depth of 20 meters. Aglipay Caves is perfect for camping activities and outdoor functions for big groups. Overnight cottages and dorm for tourists are already available nearby. The Boyscouts of the Philippines is known to frequent this as a favourite camping site and a top destination as a research area for environmentalists. Cave guides are available daily. Aglipay Caves is only 15 minutes away from Provincial Capitol. Pensal Falls – This is a three – tiered waterfalls with a nice sloping rock formation in the middle will greet you in the barangay of San Benigno, Aglipay. If you are into cliff jumping, swimming and family getaways, Pensal Falls awaits you. To get there, you should spend an hour of travel by car from Cabarroguis town proper then trek for 30 minutes passing through vast cornfields to reach the falls. Maddela Forest Resort – You need to do a short trek to reach Maddela Forest Resort at Barangay Dumabato Sur, Maddela. This resort is famous for having an excellent nature retreat and its crystal pools for swimming and picnic. It takes 40 minutes by public utility vans from Cabarroguis town proper and 5 minutes by tricycle from national highway of Maddela. Bimmapor to Siitan River Cruise - A stretch of rock formations including a jaw-dropping wonder in Bimmapor that looked like a sunken ship is a must – see and a Siitan River cruise on – board native kayaks are the highlights of trips here. You can rest your eyes to crystal clear waters while listening to the songs of wild birds on its forested riverbanks. An hour of travel time from the Provincial Capitol is needed to get to the take off point of Bimmapor. Nantugaw Falls - A towering 80 – meter high falls with a stone formation similar to a chair, thus its name is Nantugaw which is in Ilocano a furniture where you sit. Swimming while communing with nature in the surrounding forest and fish sanctuary is definitely on top jof your to – do list here. You can also do trekking while passing through a canopy of bamboos, rivers and streams. Nantugaw Falls is 20 kilometers away from the provincial road so it takes 45 minutes to get there by car then an hour and a half trek to reach it. Victoria Falls – A sanctuary for nature lovers who wants a peek of an unspoiled environment and adventure. Vans from Cordon town of Isabela to Barangay Victoria, then a trek to Victoria Falls takes an hour over farms and forestland. Governors Rapids – Gigantic perpendicular walls of limestone jutting out from one side of Cagayan river framing the Sierra Madre Mountain perfect for wall climbing. It has turbulent deep blue waters very ideal for kayaking, swimming and fishing. The riverside offers a magnificent view of the river so this is best for picnics. Agtas or Negritos call a part of this as their home. Approximately 45 minutes by private car from the Capitol Town of Cabarroguis is needed to get to Governors Rapid. Gibien Cave – A limestone that has various dripping stalactities and glowing stalagmites along with the colony of bats are a must – see in Gibien Cave. It comes with a 6 – feet depth subterranean river whom the cave guides haven’t reached the end of the tunnel yet. It takes an hour travel from Provincial Capitol to Sitio Gibien and 30 – minute walk to reach the cave entrance. Junuan falls are at nearest along national highway. Water flows and rock formations are just as easy to reach by walking through picnic platforms. You can find most of these within the circuit of Nagtipunan Tourist spots. There is also a neighboring beach you can drop by after the Dinadiawan Beach. It takes an hour and 20 minutes by car from the Provincial Capitol to reach Junuan Falls. There is no flight directly to the province of Quirino yet. You will need to get here by land transportation only through the national road from Cordon, Isabela to Dipaculao, Aurora and from Santiago City to Maddela via Jones and San Agustin, Isabela. You can use jeeps, buses, outrigger banca and tricycles. Manila to Maddela and vice – versa route is served daily via bus lines Nelbusco, Florida and Five Star. Manila to Baguio and vice – versa is available daily via NA Liner and KMS bus lines. Information credit to Department of Tourism Regional Office 2 at #2 Dalan na Pav-vurulun, Regional Government Center 3500 Tuguegarao City, Cagayan.